Respiratory Health Association (RHA) is pleased to name MeiLan K. Han, MD, MS, Associate Professor and Director of the Women’s Respiratory Clinic at University of Michigan Health System, as recipient of the 2018 Solovy Award for Advancement in COPD. 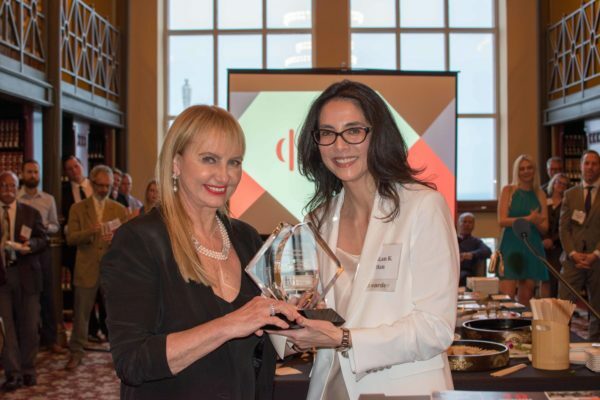 Kathleen Hart Solovy presents the 2018 Solovy Award for Advancement in COPD to Dr. MeiLan K. Han on June 28, 2018. Dr. Han has published nearly 200 publications on chronic obstructive pulmonary disease (COPD), particularly COPD in women and risk factors for acute exacerbations. Dr. Han serves on many national scientific advisory boards and is a member of the prestigious Global Obstructive Lung Disease scientific committee which is charged with developing an internationally recognized consensus on COPD diagnosis and management. Dr. Han is devoted to ensuring the best COPD care is available to patients who need it. Dr. Han has inspired a large number of junior physicians to pursue careers in COPD research and direct care of people living with COPD. Dr. Han’s scientific work, commitment to her patients and impact on advancing COPD care embody the meaning of the Solovy Award. The award was presented to Dr. Han by RHA board member Kathleen Hart Solovy as part of RHA’s year-end reception on June 28, 2018. Funding for the award is provided by the Kathleen Hart Solovy and Jerold S. Solovy Endowment for COPD.